Neurons are at the core of behaviors of all organisms, from the simplest ones to the most evolved (humans). Neurons lie along the entire route from sense organs to brain to response. Neurons are cells with special electrical properties. They can hold an electrical potential, accept potentials from other neurons, and send a potential to other neurons. The graphical representation in Figure 8.1 shows the potential activity of a neuron along with the numerical complexity the average cortical neuron handles. A neuron receives electrical inputs from its dendrites. On average, 7,000 dendrites carry a positive, excitatory electric potential while 3,000 dendrites carry a negative, inhibitory electric potential. The electrical potential received by the neuron is the net of the total excitatory and inhibitory incoming values.If the aggregate meets or exceeds the neuron’s threshold does the neural axon transmit a signal out. Otherwise, it does nothing. The neuron’s threshold is the electrical value that determines whether the neuron fires, sending an electrical signal from its axon to synapses with other neuron dendrites. electrical sum is below the neural threshold, there is no effect. In Figure 8.2 across the bottom axis, as long as the sum of the dendrite inputs is less than 78 mV, there is 0 output indicated by the red line from the axon. Then somewhere between 78–85 mV (it varies according to individual genetic makeup), the neuron’s threshold is breached and an electrical potential of 35–50 mV (again, it varies by genetic makeup) travels down the axon, away from the neural soma. No matter how much larger the electronic potential sum exceeds the threshold, the same signal is sent down its axon to all the neural synaptic terminals it leads to. [Neurons] accumulate a tiny electrical charge, with a higher concentration of negatively charged atoms and molecules inside the cell than outside it. This creates the opportunity for signaling. When the difference in charge between the inside and the outside of a neuron is reduced by a certain small amount, molecular gates in the cell membrane suddenly open, allowing a … wave of sodium influx travels down the output cable transmitting signals away from the cell … Here is the basis for the neuronal ‘action potential’, the all or nothing, binary signal that conveys the neuron’s crucial decision about whether or not to fire. The All-or-None means that all combinations of dendrite inputs that meet or exceed the threshold give rise to the same output. Savor that for a moment—different data has the same effect. That is displayed in the Figure 8.2, the neural threshold graph, but there’s it merely a red, straight parallel line at the axon potential (aka the action potential). If additional dendrites deliver additional electrical potential into the neural soma, the axon output is unaffected. Downstream synapses will receive the same signal from this neuron. Let’s consider two input sets (Figure 8.3 and Figure 8.4) which are slightly different, but both deliver potential greater than the threshold. Figure 8.3 The combination of 6012 excitatory dendrites and 2904 inhibitory dendrites result in the triggering of the neuron’s axon potential. Figure 8.4 The combination of 6016 excitatory dendrites and 2907 inhibitory dendrites result in the triggering of the neuron’s axon potential. Roughly ten thousands inputs have the potential to delivery their signal to the receiving neuron. Many may be silent (not triggered) and deliver nothing to the neuron. 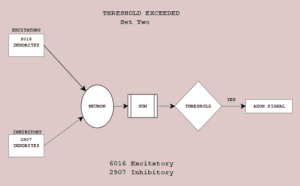 In Figure 8.2 a pattern of 6012 excitatory and 2904 inhibitory dendrites are summed and exceed the neural threshold. Its action potential flows down the axon towards downstream neurons. In Figure 8.3, a slightly different input set (6016 excitatory and 2907 inhibitory dendrites) exceed the neural threshold. It too sends the action potential towards downstream neurons. The fact that two different sets of input data can result in identical output is a surprising occurrence with profound consequences. It lies beneath the categorization of inputs. 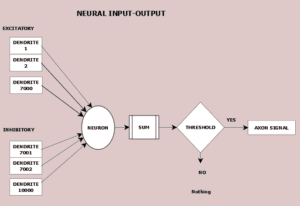 Additional inputs (details in the pattern) beyond that need to surmount the threshold are unknown to downstream neurons. That is abstraction in action—the simplification that lies beneath categorization. Let’s call this feature the Almost Gate. It’s a feature of each neuron. Although it’s not a perfect analog, Figure 8.4 captures the essence of the Almost Gate. 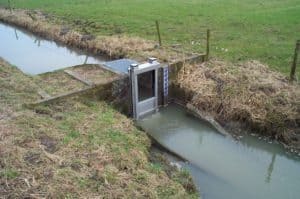 If a flow is lower than the gate (the threshold) the land stays dry. Contrariwise, if the flow exceeds the gate and it doesn’t matter by how much, the land beyond will get wet. Once the Almost Gate is exceeded, the identical information is transmitted through the action potential, despite potentially a myriad of small differences in the input pattern. The height of the Almost Gate is a measure of the fit between the outside world and our internal image of the outside world. This may seem a trivial point about sensory input. You see a complete line, no matter if a pixel is missing or perhaps an extra dot off the line is received at your retina. However, let’s not forget that this neural activity occurs not only at the first receipt of sensory data. The Almost Gate is enforced on all the transfers of information—as inputs travel up the pathways to integration with other sensory data up to the prefrontal lobe for use in decision-making and then back down to behavior generation. The importance of this is paramount in Neural Cascades. 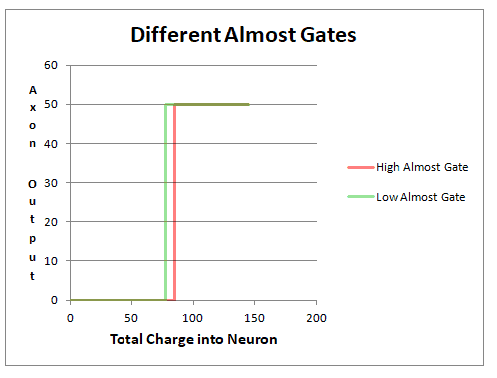 The Almost Gate is a feature of individual neurons. Patterns are a set of neurons acting in unison. An important way that neurons as in a group are neural layers (cell assemblies). In neural layers, a set of neurons handle a mass of similar inputs. Various neurons in the layer become winning neurons, associated with particular inputs. The weights (the efficiency of the electrical transmissions between the neurons) are shared across the layer. How do patterns get formed, when an indeterminate set of input triggers the same neural firing? Patterns are formed at an interior layer of neurons, not at an individual neuron. Many neurons from the sensory layer are connected to the interior layer. Pattern formation is the spontaneous action of a self-organizing network. Teuvo Kohonen proposed an artificial neural structure that provides such a feature, a self-organizing map (SOM). It requires all input neurons to be connected to all neurons in the receiving layer, plus all receiving layer neurons are connected to all other receiving neurons. The interconnections within the receiving layer are such that neurons nearby the winning neuron are given a small positive signal, while neurons distant are given a small negative (inhibitory) signal. Although the human brain details will alter from Kohonen’s model, it is a good simplified model for the brain’s action. Maps in the Brain has more detail on this network structure. An important biological law was identified by Donald O. Hebb. Here discussed in Scholarpedia. “When an axon of cell A is near enough to excite B and repeatedly or persistently takes part in firing it, some growth process or metabolic change takes place in one or both cells such that A’s efficiency, as one of the cells firing B, is increased. In other words, Neurons that fire together now will fire together more easily in the future. Let’s consider 3 letters of the alphabet–I, L, and T, as represented in a 5×7 grid. Each of the 35 positions in the grid contribute an excitatory potential if sensory neurons pass on that the pixel is lit and no potential if the pixel is off. These three letters if delivered to a single neuron would have the same output since they deliver the same electrical potential to the neuron. Something else is involved in resolving these simple images. These 35 neurons fire the inputs for the above lit positions to the receiving neuron layer. Each image has the same number of excitatory inputs, 11. A single receiving neuron in the layer is triggered when an I, L or T is presented to it. The connections to the neurons from the input layer and between the receiving layer are adjusted for the entire set of inputs. These connections are shared for all inputs into the neural layer. The odd-ball pattern is rarely seen. It is not learned. Because it doesn’t satisfy the frequency requirement of Hebb’s Law, the strength of connections leading to a winning neuron is not formed. This receiving layer serves multiple letters. Although distinct winning neurons represent different letters, the connection weights must accommodate all the letters simultaneously. This implies that the winning neurons do not hold the complete information, since the weights must be spread so that all letters are handled. This recognition by the neural layer of various patterns is innate and the ground floor of pattern formation. After we learn patterns for a certain skill, the flexibility of the neural synapses to adjust to new patterns stiffens. Learning and the efficiency of electrical transmission and the ease of changing that efficiency at the synapses varies dramatically within an individual at stages of physical development. The role a person’s age (physical stage) is discussed in the learning stages in Brain through the Ages and Development to the Adult Brain. The neural threshold is not the same in all individuals. Genetic endowment sets boundaries on a person’s neural transmitters. In Figure 8.9 is a threshold graph of two individuals. The individual with the higher Almost Gate (in red) requires a potential (85 mV) for the axon to fire. The second individual with the lower Almost Gate (in green) requires a potential (78 mV) for the axon to fire. The second individual requires less of the input pattern to be present to fire the neuron. In a crude way, we may say that a high Almost Gate tends one to insist more matches for the same category (more dotting i’s and crossing t’s), than a low Almost Gate which categorizes easier but less specifically. In addition to the neural threshold having an idiosyncratic (specific to a particular person) level, the axon output (Figure 8.10) of a person’s neurons has an idiosyncratic amount (ranging from 35 to 50 mV). If a person has an axon output of 50 mV, then the amount of electrical potential delivered to the dendrite, across the weighting of the synapse, can be greater than that of a person who’s axon output is 35 mV. All other things being equal, a higher axon output means that fewer dendrites delivering information to the neuron are needed to reach that person’s neural threshold. 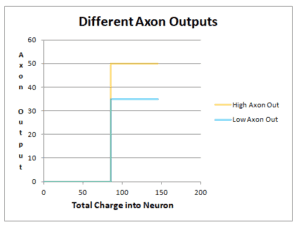 The implications of higher or lower axon output is not considered further at this time. A person with a low Almost Gate and a high axon output requires a lower match between the current input and remembered categories to make the association compared to a person with a high Almost Gate and a low axon output. The mechanism of matching is the focus in Induction, Analogy, and the Almost Gate. To stereotype, people with low Almost Gates have creative outlooks. They see similarities in situations that seem distinctly different to those with high Almost Gates. With higher thresholds more similarities are required for categorization and recognition to take place. See also Almost Gate, Implications for Individuals. Another confounding factor in the easy explication of the Almost Gate is that a person’s individual neural threshold is affected by the level of certain neuroactive chemicals, such as dopamine. It is well known that dopamine is secreted during states of high stress, as in flight-or-fight situations. Dopamine doesn’t trigger one neuron. It’s not acting as a neurotransmitter, but as a neuromodulator, affecting many neurons. The effect of dopamine is to increase the contrast of an image. The interpretation of the situation becomes more black-and-white Spitzer (p 273–275). Our choices are more constrained and more focused until the dopamine level returns to our normal level. It’s time to discuss how local groups of neurons act together, forming maps in the brain. I have simplified the neural firing discussion by removing the neuron spike train theory because it does not alter the fundamental idea of the neural threshold and the All-or-None principle. All sets of input which cause the signal to be triggered are treated the same downstream.